Featuring a foreword by motivational speaker Mike Robbins, Inspirational Quotes offers daily doses of wit and wisdom, from beloved authors and musicians to notable philosophers and politicians. Prepare for a diverse collection of inspirational quotes that will infuse your day with appreciation and encouragement. There's no right or wrong way to read 365 Inspirational Quotes. Dive in from day one, read it backwards, or pick a page at random. Whatever your method, you'll receive the same nuggets of inspiration covering a wide-range of themes: from embracing creativity to sustaining spirituality to falling in love-plus inspirational quotes tailored to the major U.S. holidays, and even some of the little ones (like April Fool's Day). 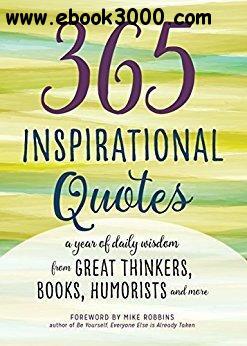 Perfectly sized for a nightstand staple or an on-the-go guide, 365 Inspirational Quotes makes the ideal companion as you start or end your day-or whenever you need an uplifting pick-me-up.